1. Skating - Skating enables the students to create balance of the body and synchronize it to move forward without falling down from the skates. While performing the activity the safety concern is always borne in mind. 2. Taekwondo - This martial art is a perfect combination of mind and body. A child learns to concentrate on the moves while safeguarding his life. At year end, a Belt Test is taken of all the students and they are promoted to the next level. 3. Basketball - Basket ball is a sport played by two teams of five players on a rectangular court. The objective is to shoot a ball through a hoop 18 inches (46 cm) in diameter and 10 feet (3.048 m) high mounted to a backboard at each end. Experienced coaches guide the students. 4. Athletics - Athletics encapsulates all the sports that aim at increasing the stamina and concentration of a person. We train the students in track and field events and power exercises. 5. Badminton – This sport enables the players to enhance their physical as well as mental capacity. It also helps them in attaining height. 6. Table Tennis - Its a game of controlled movement and flexibility of the body. In the club, the players are taught how to handle the strikes and the rules associated with the game. 7. Chess : Chess is a two-player strategy board game played on a chessboard, a checkered gameboard with 64 squares arranged in an 8×8 grid. 8. Football : Football is a team sport played between two teams of eleven players with a spherical ball. It is played by 250 million players in over 200 countries, making it the world’s most popular sport. 9. Cricket : Cricket is a bat-and-ball game played between two teams of eleven players each on a cricket field, at the centre of which is a rectangular 22-yard-long pitch with a target called the wicket (a set of three wooden stumps topped by two bails) at each end. 10. 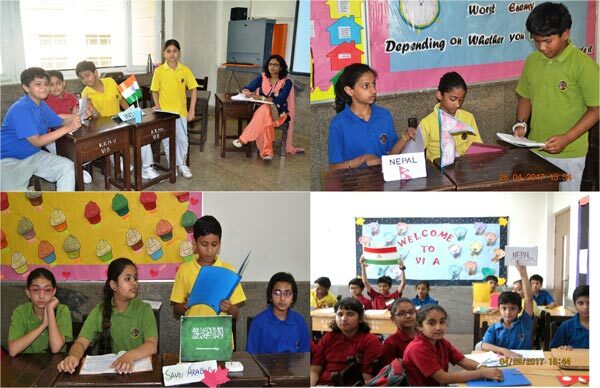 Space Club : The Universe in the School Programme (UITS) is a unique model that introduces students to an enthralling world of Astronomy and Space Sciences through activities, experiments, games and quizzes. 11. Multimedia and Animation - In today’s techno savvy world, the knowledge of multimedia is a desirable trait. In this club, the students learn about multimedia and animation operations like creating drawings, cartoons, graphics, etc. 12. MUN: Model United Nations, also known as Model UN or MUN, is an extra-curricular activity in which students typically roleplay delegates to the United Nations and simulate UN committees. 13. Art and Craft - This club takes the aspiring Picassos into a vibrant world of creativity, imagination and colors. 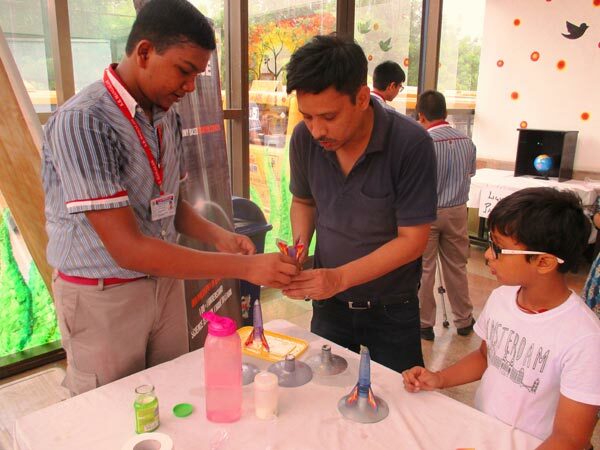 Apart from the routine art activities like sketching, charcoal drawing, painting, etc, the students are also guided to create objects of art using craft materials especially waste materials. 14. Western Music: The club offers training of stringed as well as percussion instruments like guitar, drums, congo, etc. 15. Dramatics and Theatre – Arts-Dramatics and Theatre Arts provide a vent to the students through which they can release their emotions. They learn to be more confident and in turn develop their oratorical skills. 16. Home Science - Home Science, or the science of a home, includes all the things that concern the person, home, family members and resources. It is the education for “better living” and the core of this education is the family ecosystem. 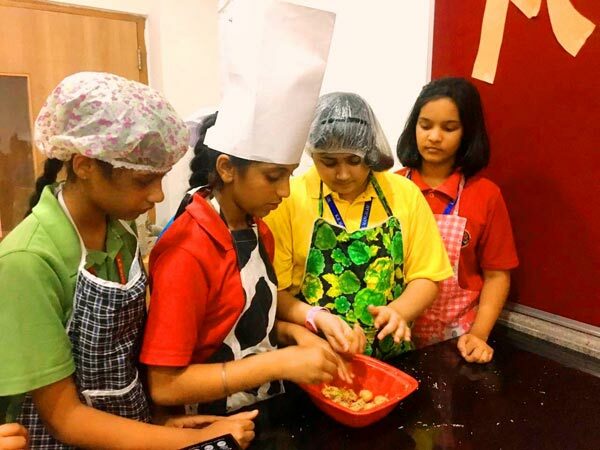 In this club, the students are taught the nuances of home management and the skills required for it. 17. Indian Music: In this club, the students are exposed to the Indian music and instruments like tabla, etc. They are trained in voice modulation and the ragas. 18. Western Dance - This club enables the aspiring dancers to synchronize their body movements with the beats. The club provides training in Hip Hop, Salsa, Contemporary and Fusion Dance styles. 19. Indian Dance - Dance is the art of movement of the body, usually rhythmically and to music, using prescribed or improvised steps and gestures. The dance trainees learn classical dance styles as Kathak, Bharatnatyam, etc. 20. 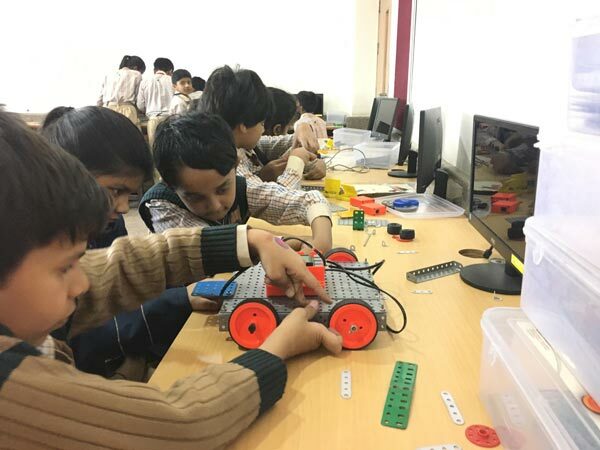 Robotics – Robotics brings together several very different engineering areas and skills. There is metalworking for the body. There is mechanics for mounting the wheels on the axles, connecting them to the motors and keeping the body in balance. You need electronics to power the motors and connect the sensors to the controllers. At last, you need the software to understand the sensors and drive the robot around. This club trains the students in these aspects.